I have a degree in Earth Sciences, ask me anything. I've been reading in this forum for a while now and quite often a subject related to geology would come along, and sometimes a lot of good information and explanations were left out. Hence this thread; any questions regarding the earth's origin, interior, magnetic field, plate tectonics, rock dating, feel free to ask. Or anything else that's related and needs clearing up, really. PS. I'm a globe earther and feel very comfortable about it. The model works. I aim to educate people but actively trying to destroy beliefs goes against my morals. Re: I have a degree in Earth Sciences, ask me anything. I appreciate what you do, but believe me - it won't work. People here are like 40% round earthers, 40% trolls, and 20% retards or maniacs that REALLY believe the earth is flat. People here are like 40% round earthers, 40% trolls, and 10% retards or maniacs that REALLY believe the earth is flat. Yeah I figured this place would attract a lot of trolls and people who just really really like arguing. Hopefully there's some actual interest. Hence this thread; any questions regarding the earth's origin, interior, magnetic field, plate tectonics, rock dating, feel free to ask. How are the magnetic and gravitational fluctuations of Earth and the Moon calculated in orbital patterns? Are you deliberately trying to stump me? I know how all the things in your question seperately work but the whole question makes 0 sense to me. What's the relation even between the magnetic field and orbital patterns? Welcome to FES RocksEverywhere. Good luck! Hence this thread; any questions regarding the earth's origin, interior, magnetic field, plate tectonics, rock dating, feel free to ask. Or anything else that's related and needs clearing up, really. It takes less than thirty seconds to put an end to your incursion here. You have no answers when it comes to the origin of the granite, the isotope dating paradoxes, the comets' tails dating proofs and much more. Imagine what would happen to you if I were to bring up the three body problem paradox, that is, the fact that the RE orbital equations of motion lead to homoclinic tangles. Still, the remaining 5% are those who only think they are good in math, are here just to make their fame only. "If you insist it is a spinning globe, then why are you here?" - Simple. To counter the misinformation you are spreading to uneducated, and gullible people. It is the duty of every thinking person to oppose those who would spread lies. Well I was about to ask a question but I see Sandokhan is here to debate an actual scientist so now I just need to get some popcorn instead. Hope you're hungry. You're about to get all the copy pasta you can eat. What exactly is the problem with the theory that granite is the result of melting crustal rocks? Furthermore I'm not familiar with the isotope dating paradoxes, the comets' tails dating proofs and "much more", so... entertain me. Can somebody inform our friend of what is about to happen to him? You are actually challenging me on geology, astrophysics, physics, paleoastronomy, chronological dating, and much more? We have cross-checked archaeological, astronomical, dendro-chronological, paleo-graphical and radiocarbon methods of dating of ancient sources and artefacts. We found them ALL to be non-independent, non-exact, statistically implausible, contradictory and inevitably viciously circular because they are based or calibrated on the same consensual chronology. Unbelievable as it may seem, there is not a single piece of firm written evidence or artefact that could be reliably and independently dated earlier than the XI century. Classical history is firmly based on copies made in the XV-XVII centuries of 'unfortunately lost' originals. 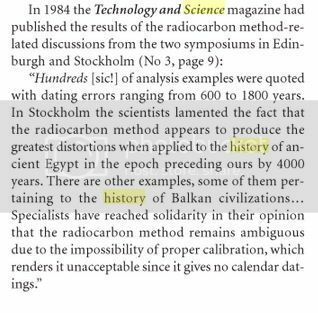 It just happens that there is no valid irrefutable scientific proof that ALL ‘ancient’ artefacts are much older than 1000 years contrary to the self fulfilling radiocarbon dating obligingly rubber-stamped by radiocarbon labs to the prescriptions of the mainstream historians. How heartbreaking is that the oldest ORIGINAL written documents that can be reliably, irrefutably and unambiguously dated belong only to the 11th century! All dirty and worn out originals have somehow disappeared in the Very Dark Ages, as illiterate but tidy monks kept only brand new copies. Better yet, most of the very old original document of 11th-13th tell very peculiar stories completely out of line with the consensual history. 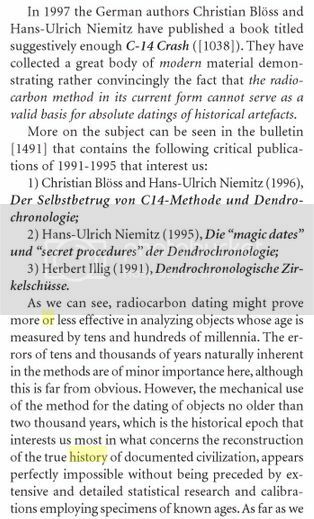 Very sorry about c14 radiocarbon dating methods, the poor Nobel Libby must be turning in his grave after ‘calibration’ of his method (pity that!). 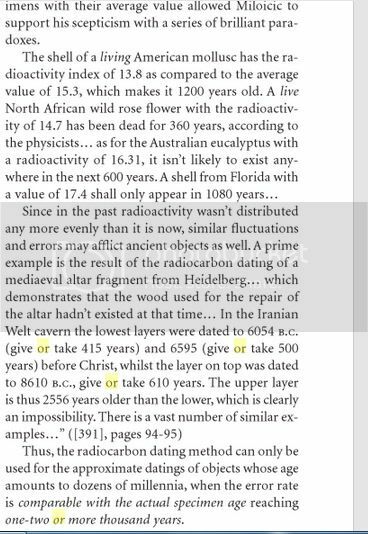 By ‘calibration’ on statistically non-significant number of wood samples from Egypt with ARBITRARELY suggested alleged age of 3100 B.C. 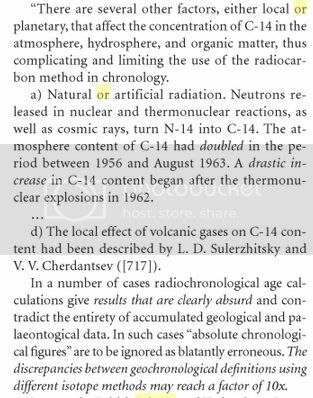 the Arizona university radiocarbon team simply smuggled the consensual chronology into c14 method of dating, turning it into a sheer fallacy. 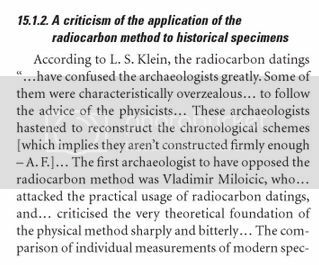 The c14 radiocarbon dating procedure runs as follows: archaeologist sends an artefact to a radiocarbon dating laboratory with his idea of the age of the object to get a to ‘scientific’ rubber-stamp. Laboratory gladly complies and makes required radio dating, confirming the date suggested by archaeologist. Everybody’s happy: lab makes good money by making an expensive test, archaeologist by reaping the laurels for his earth shattering discovery. The in-built low precision (because of sensitivity) of this method allows cooking scientifically looking results desired by the customer archaeologist. General public doesn’t realize that it was duped again. Just try to submit to any c14 lab a sample of organic matter and ask them to date it. The lab will ask your idea of the age of the sample, then it fiddles with the lots of knobs (‘fine-tuning’) and gives you the result as you’ve ‘expected’. With c14 dating method being so mind bogglingly precise C14 labs decline making 'black box' test of any kind absolutely. Nah, they assert that because their method is SO very sensitive they must have maximum information about the sample. This much touted method often produces reliable dating of objects of organic origin with exactitude (mistakes that) of up to plus minus 1500 years, therefore it is too crude for dating of historical events in the 3000 years timeframe! Isotopic dating: science or fiction? The methods described above cannot be used to date anything. The only accurate and direct method is: comets as luminous bodes MUST have limited lives. When passing close to the sun, comets emit tails. It is assumed that the material of the tail does not return to the comet's head but is dispersed in space; consequently, the comets as luminous bodies must have a limited life. If Halley's comet has pursued its present orbit since late pre-Cambrian times, it must "have grown and lost eight million tails, which seems improbable." If comets are wasted, their number in the solar system must permanently diminish, and no comet of short period could have preserved its tail since geological times. 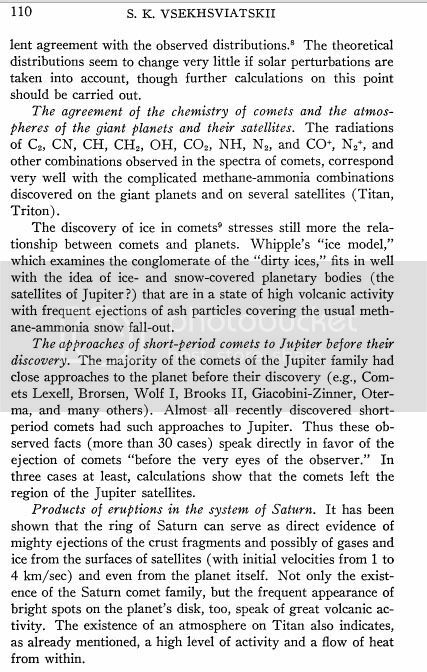 But as there are many luminous comets of short period, they must have been produced or acquired at some time when other members of the system, the planets and the satellites, were already in their places. The age of the Solar System must be less than the estimated upper age of comets. 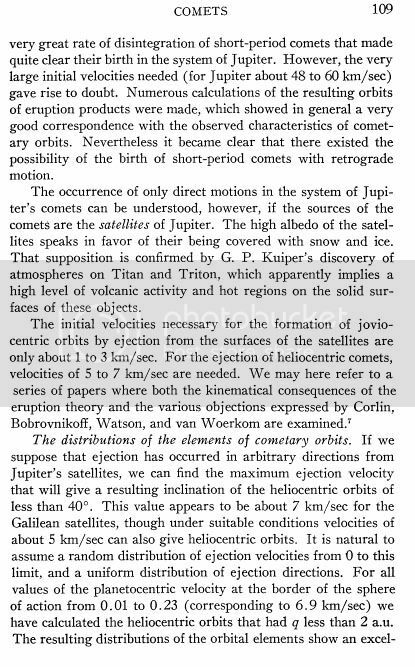 The usual explanation for the Saturnian and Jovian families of comets is that they had originally traveled on extremely elongated or even parabolic orbits and, passing close to one of the large planets, were changed into short-period comets, traveling on ellipses—it is usual to say that they were “captured.” However, the Russian astronomer K. Vshekhsviatsky of the Kiev Observatory, one of the leading authorities on comets, has brought strong arguments to show that the comets of the solar system are very youthful bodies—only a few thousand years old—and that they originated in explosions from the planets, especially from the major planets Saturn and Jupiter or their moons. By comparing the observed luminosity of the periodic comets on their subsequent returns, he found it failing and their masses rapidly diminishing by loss of matter to the space through which they travel; the head of the comet emits tails on each passage close to the sun and then dissipates the matter of the tails without recovery. 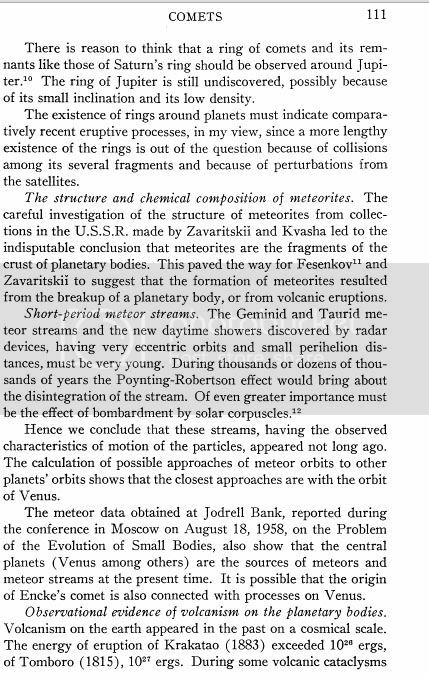 Thus Vshekhsviatsky concluded that comets of short duration originated in the solar system, were not captured from outside of that system—a point to which the majority of astronomers still adhere—and that they came into existence by explosion from Jupiter and Saturn, and to a smaller extent by explosion from the smaller planets, like Venus and Mars. 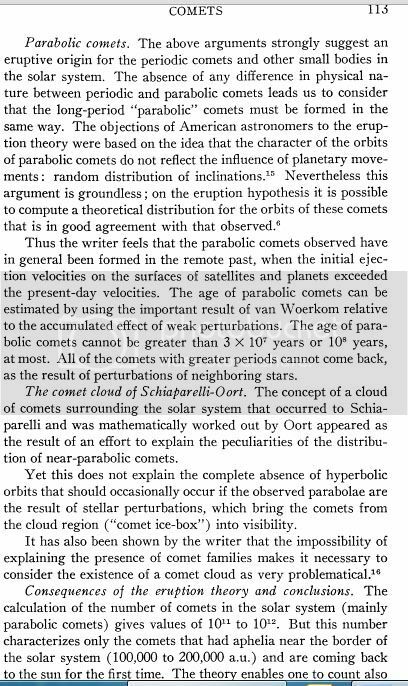 K. Vshekhsviatsky was the leading expert in comet astrophysics as his works clearly demonstrate this. 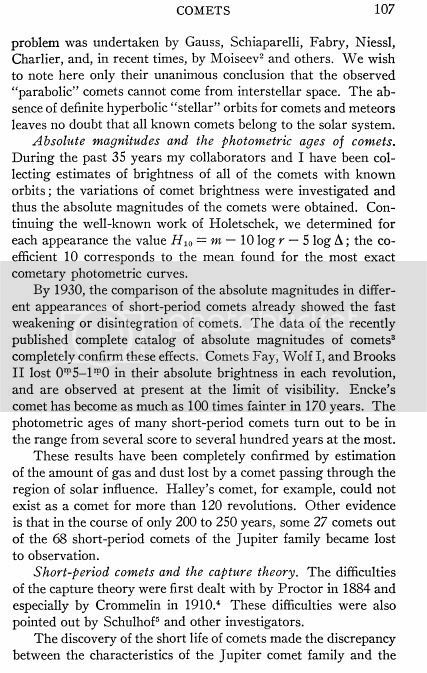 PAGE 107: Halley's comet, for example, could not exist as a comet for more than 120 revolutions. 15 kilometers long, 8 kilometers wide and perhaps 8 kilometers thick. Comet Halley, as well as other comets, may have only been orbiting in its present orbit for only a few thousand years. That is, the age of the entire solar system cannot be more than 2,500-3,000 years old - an extraordinary agreement with the results of the facts that can be deduced from the new chronology subject. However, as we have seen, the size of the Sun/Moon/planets/comets in the fixed flat earth context (see the proofs using the Solar ISS transit videos/Antarctica photographs) is much smaller than in the assumed heliocentric framework. 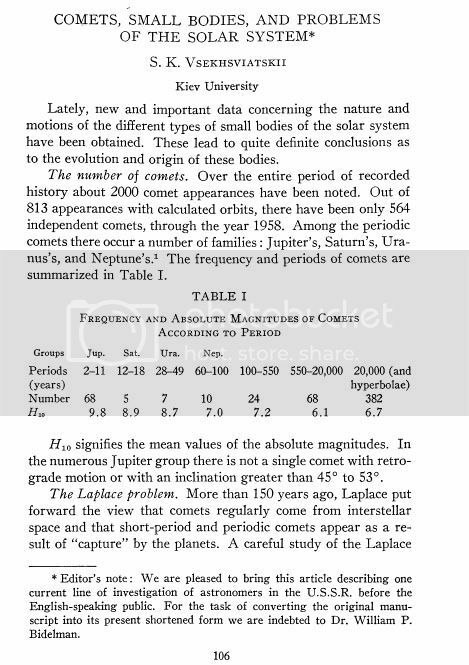 In the full fixed flat earth context, a comet has only some 20-30 meters in diameter: thus the dissipation rate of the material in a comet's tail (Halley's comet for example) does prove that Halley's comet has pursued its present orbit for only a few hundred years (another proof for the new radical chronology theory). Once upon a time there was granite rock. Granite is a very unique rock but at the same time is very common and plentiful. It can easily be found in mountain areas such as the Rocky Mountains of Colorado. Granite is easily identified by its hard crystalline structure and light color. The crystals are large enough to be easily seen with the eye. It has an interesting structure with a mixture of light-colored quartz and feldspar crystals, and darker crystals of mica and hornblende. Granite is solid and hard without cracks or seams, and it is very strong. Granite has another very unique property in that it cannot be created by scientists. It is considered to be an "original" material in the Earth. When melted and allowed to harden, it does not return to the original granite crystalline structure. The new smaller crystalline material is called rhyolite. Granite cannot be made by cooling the initial molten materials. This is very important, so remember this fact. Granite never contains fossils such as are found in sedimentary rocks. All of these properties have led many scientists to refer to granite as a creation rock, since it could not have solidified from molten material according to the evolutionary theory. Evolution cannot explain the presence of granite in its present structure. And where is this granite? Everywhere. Granite is the bedrock shell which encloses the entire Earth. Its exact thickness is unknown, but scientists have speculated that it forms a layer about 4.35 miles (7 km) thick, and in some areas possibly 20 miles (32 km) thick. It occurs on every continent. Geologist's built the theory of an evolving earth on the premise that the basement granites formed naturally. They did this without having firm scientific evidence for their formation. (30) Rhyolite is a pale rock with tiny crystals that is said to be the result of granite cooling over a long time under the earth's surface. (31) It is assumed that granite forms very deep under the surface, because they have larger crystals than rhyolite. But rhyolite samples said to have formed 1683 feet below the surface only have tiny crystals. (32) Experiments were conducted in the 1960's where granite was melted, then cooled slowly under conditions similar to those believed to exist deep inside the earth. The result produced a rock identical to rhyolite. (33) Granite halos therefore show that granites formed under unnatural conditions. (34) Geologist Andrew Snelling examined many granite outcrops and found that there was no mixing between the granite and other rocks that formed at the same time. (35) Mixing should occur if different types of rocks formed from molten magma that cooled over millions of years. There should not be distinct boundaries between them. By the way... you know what is coming up next: a full debate on Gauss' Easter formula applied to chronology. You. Yes you. Stand still laddie. Carbon dating is no good for dating granite, you'd be laughed at for even trying. Rhyolite is extrusive igneous material, granite is intrusive. They are essentially the same, what differs is the way they are produced. Referencing threads on David Icke pretty much shows how desperate that self-referential godbothering nutjobbery is. Facts won't do what I want them to. You must be retarded. Real expert is able to explain a subject in pretty short words. Of course, to non-retarded one. The subject of geological dating encompasses tens of thousands of pages: if you, a full blooded f***tard cannot take this much, you probably shouldn't be here. It takes an expert to condense these tens of thousands of pages into a few paragraphs. Here is the FAINT YOUNG SUN PARADOX. The complete demonstration that the age of the Sun cannot exceed some ten million years (that is, we find ourselves right at the beginning of the main-sequence lifetime of the Sun, when no fluctuations in luminosity could have taken place); over the past 25 years there have been several attempts made to try to explain the paradox, all such efforts have failed, see the six links below. “Paradox Solved” – no, hardly, as the estimates for the young Earth CO2 levels were considerably less as pointed out by a recent paper in GRL, and this paper is based upon climate models which are unable to replicate even the Holocene, RWP, MWP, LIA, 20th and 21st centuries. Supposedly the Sun has been a main-sequence star since its formation about 4.6 billion years ago. This time represents about half the assumed ten-billion-year main-sequence lifetime of the Sun, so the Sun should have used about half its energy store. This means that about half the hydrogen in the core of the Sun has been used up and replaced by helium. This change in chemical composition changes the structure of the core. The overall structure of the Sun would have to change as well, so that today, the Sun should be nearly 40% brighter than it was 4.6 billion years ago. This obviously has consequences for the temperatures of the planets. It is generally believed that even small fluctuations in the Sun's luminosity would have devastating consequences on Earth's climate. A 40% change in solar luminosity should have produced dramatic climatic changes. According to evolution, about four billion years ago when life supposedly first arose on Earth, the temperature had to have been close to what the temperature is today. But if that were the case, the subsequent increase in the Sun's luminosity would have made Earth far too hot for life today. One could naively suggest that Earth began cooler than it is today and has been slowly warming with time. But this is not an option because geologists note that Earth's rock record insists that Earth's average temperature has not varied much over the past four billion years, and biologists require a nearly constant average temperature for the development and evolution of life. This problem is called the early faint Sun paradox. Evolution proposes that the early atmosphere contained a greater amount of greenhouse gases (such as methane) than today. This would have produced average temperatures close to those today, even with a much fainter Sun. As the Sun gradually increased in luminosity, Earth's atmosphere is supposed to have evolved along with it, so that the amount of greenhouse gases have slowly decreased to compensate for the increasing solar luminosity. The precise tuning of this alleged co-evolution is nothing short of miraculous. The mechanism driving this would have to be a complex system of negative feedbacks working very gradually, though it is not at all clear how such feedbacks could occur. At any point, a slight positive feedback would have completely disrupted the system, with catastrophic consequences similar to those of Venus or Mars. For instance, the current makeup of Earth's atmosphere is in a non-equilibrium state that is maintained by the widespread diversity of life. There is no evolutionary imperative that this be the case: it is just the way it is. Thus the incredibly unlikely origin and evolution of life had to be accompanied by the evolution of Earth's atmosphere in concert with the Sun. The implausibility of such a process has caused Lovelock to propose his Gaia hypothesis. According to this, the biosphere (consisting of Earth's oceans, atmosphere, crust, and all living things) constitutes a sort of super organism that has evolved. Life has developed in such a way that the atmosphere has been altered to protect it in the face of increasing solar luminosity. Lovelock's hypothesis has not been generally accepted, largely because of the spiritual implications. Indeed, it does seem to lead to a mystical sort of view. If billions of years were true, the sun would have been much fainter in the past. However, there is no evidence that the sun was fainter at any time in the earth's history. Astronomers call this the faint young sun paradox. Evolutionists and long-agers believe that life appeared on the earth about 3.8 billion years ago. But if that timescale were true, the sun would be 25% brighter today than it was back then. This implies that the earth would have been frozen at an average temperature of -3 C. However, most paleontologists believe that, if anything, the earth was warmer in the past. The only way around this is to make arbitrary and unrealistic assumptions of a far greater greenhouse effect at that time than exists today, with about 1,000 times more CO2 in the atmosphere than there is today. The physical principles that cause the early faint Sun paradox are well established, so astrophysicists are confident that the effect is real. Consequently, evolutionists have a choice of two explanations as to how Earth has maintained nearly constant temperature in spite of a steadily increasing influx of energy. In the first alternative, one can believe that through undirected change, the atmosphere has evolved to counteract heating. At best this means that the atmosphere has evolved through a series of states of unstable equilibrium or even non-equilibrium. Individual living organisms do something akin to this, driven by complex instructions encoded into DNA. Death is a process in which the complex chemical reactions of life ceases and cells rapidly approach chemical equilibrium. Short of some guiding intelligence or design, a similar process for the atmosphere seems incredibly improbable. Any sort of symbioses or true feedback with the Sun is entirely out of the question. On the other hand, one can believe that some sort of life force has directed the atmosphere's evolution through this ordeal. Most find the teleological or spiritual implications of this unpalatable, though there is a trend in this direction in physics. A much higher concentration of carbon dioxide in Earth's atmosphere has been suggested to maintain a proper temperature. This is an inferrence supported by no geological evidence whatsoever. Studies of iron carbonates by Rye et al. 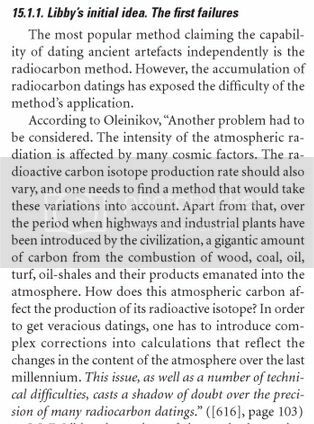 conclusively show that Earth had at most 20 percent the required amount of CO2. We have evidence that Mars also had temperatures suitable for liquid in its distant past. It is unlikely that CO2 would custom-heat both planets. Some geochemical feedback may be possible, but it appears unlikely to be sufficient. Living organisms, too, started converting carbon dioxide into oxygen and organic matter, substantially decreasing the greenhouse effect as soon as photosynthesis got going. There is, however, no obvious reason for this process to keep exactly in step with the sun's increasing luminosity. It may be that we have simply been lucky, but as an explanation that is not entirely satisfactory. If the tuning did need to be very precise, Faulkner would have a point in calling it 'miraculous'. As a result of a fainter Sun, the temperature on ancient Earth should have been some 25 C lower than today. Such a low temperature should have kept large parts of Earth frozen until about one to two billion years ago. The case for Mars is even more extreme due to its greater distance from the Sun. Yet there is compelling geologic evidence suggesting that liquid water was abundant on both planets three to four billion years ago. Earth's oldest rocks, which are found in northern Canada and in the southwestern part of Greenland, date back nearly four billion years to the early Archean eon. Within these ancient rock samples are rounded 'pebbles' that appear to be sedimentary, laid down in a liquid-water environment. Rocks as old as 3.2 billion years exhibit mud cracks, ripple marks, and microfossil algae. All of these pieces of evidence indicate that early Earth must have had an abundant supply of liquid water in the form of lakes or oceans. 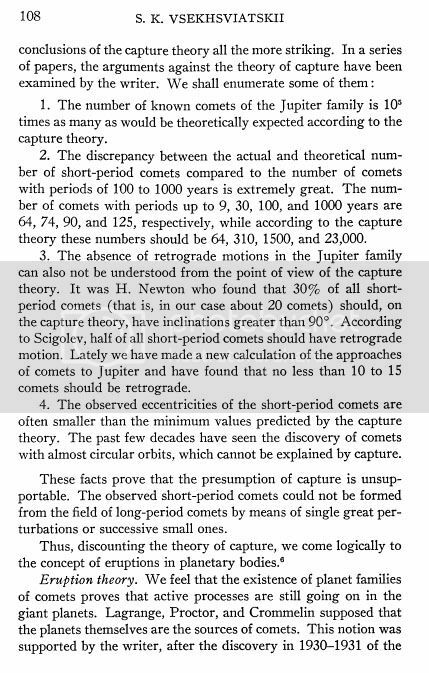 The Faint Young Sun Paradox remains to this day one of the most devastating proofs against the spherical earth hypothesis (not nearly enough time for the earth's formation/evolution). 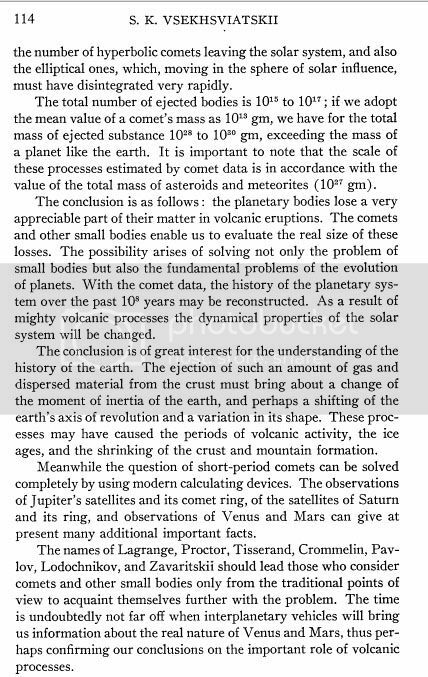 We also have the Martian Faint Young Sun Paradox which, believe it or not, is much worse for the RE. That's an example of the "maniac"-type. ain't that Sandy guy the one who bangs on about the slightly transparent extra celestial body that causes the lunar eclipse? You certainly are not an expert. I would see rather another one. he's going to get spammed with articles you don't really understand and you'll never listen to criticism? I think he'll figure that out on his own. But I am an expert. 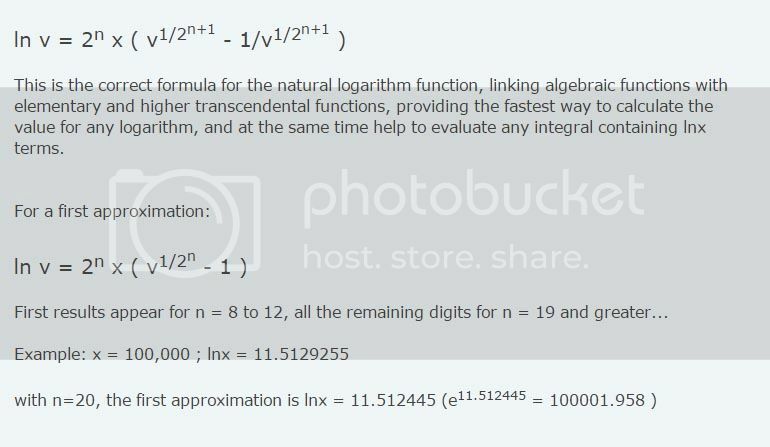 I wrote the book on the global natural logarithm formula, which by the way could be used in certain equations pertaining to geological dating. ...who bangs on about the slightly transparent extra celestial body that causes the lunar eclipse? You are about to make my day. You have never heard of the Allais effect, have you? We all know that the more desperate sand Ho Ken becomes, the longer his walls of text become. Yeah but usually he doesn't start off with a gish gallop this fierce though. He must have a personal grudge against actual scientists. although to be fair, it's Eric Dubay's fault for manipulating people into thinking the sun and the moon being seen in the sky at the same time rules out the possibility of the lunar eclipse being our shadow..
Can I get a link to that book please? You need to update your knowledge on the shadowing effect of gravitons. Note that Newton never stated that gravity is necessarily an attractive force. In fact we find that both the concept of gravitational 'pull' and that of being an inherent property of matter are specifically denied by Newton himself to whom the concept is most often erroneously ascribed. You sometimes speak of gravity as essential and inherent to matter. Pray do not ascribe that notion to me, for the cause of gravity is what I do not pretend to know, and therefore would take more time to consider of it. In his third letter, dated February 25,1692-3, he expresses himself somewhat less guardedly : It is inconceivable that inanimate brute matter should, without the mediation of something else which is not material, operate upon and affect other matter, without mutual contact, as it must do if gravitation in the sense of Epicurus be essential and inherent in it. And this is one reason why I desired you would not ascribe 'innate gravity' to me. That gravity should be innate, inherent, and essential to matter, so that one body may act upon another at a distance, through a vacuum, without the mediation of anything else, by and through which their action and force may be conveyed from one to another,is to me so great an absurdity, that I believe no man who has in philosophical matters a competent faculty of thinking can ever fall into it. Gravity must be caused by an agent acting constantly according to certain laws; but whether this agent be material or immaterial, I have left to the consideration of my readers. Hitherto I have not been able to discover the cause of those properties of gravity from phenomena, and I frame no hypothesis ; for whatever is not deduced from the phenomena is to be called an hypothesis...As soon as one frees himself from the innate force concept, it becomes obvious that the most obvious way for an external agent to move two bodies towards each other is for it to PUSH them towards each other. "and we derive from the celestial phenomena the forces of gravity with which bodies tend to the sun and the several planets. Then from these forces, by other propositions which are also mathematical, we deduce the motions of the planets, the comets, the moon, and the sea. I wish we could derive the rest of the phenomena of nature by the same kind of reasoning from mechanical principles; for I am induced by many reasons to suspect that they may all depend upon certain forces by which the particles of bodies, by some causes hitherto unknown, are either mutually impelled towards each other, and cohere in regular figures, or are repelled and recede from each other; which forces being unknown, philosophers have hitherto attempted the search of nature in vain; but I hope the principles here laid down will afford some light either to this or some truer method of philosophy." Even more specifically, in Query 31 he affirms the following:"How these attractions may be performed I do not here consider. What I call attraction may be caused by impulse, or by some other means unknown to me. I use that word here to signify only in general any force by which bodies tend toward one another, whatsoever be the cause." On page 2 of Principia, Newton wrote that gravity can be either an impelled or attractive force as follows, "A centripetal force is that by which bodies are drawn or impelled, or in any way tend, towards a point as to a center. Of this sort is gravity." Searching in his early notebooks under the heading "Quaestiones" Newton speculates that gravity is caused by the descent of rays which strike all bodies and pushes them down. "Whither ye rays of gravity may be stopped by reflecting or refracting ..."
In fact, cosmic waves have far greater penetrating power than the man-made gamma radiation, and can even pass through a thickness of two metres of lead. The highest frequency possible, that is, the shortest wavelength limit is equal to the dimension of the unit element making up space-time itself, equal to Planck length, radiating at a frequency of 7.4E42Hz. As you might be thinking already, the radiation pressure exerted by such high frequency radiation, in the top part of the EM spectrum, would be a perfect candidate for the gravity effect, since such radiation would penetrate ANY matter and act all over its constituent particles, not just its surface. The radiation can be visualised as a shower of high energy EM waves imparting impulses of momentum to all bodies in space. It also explains the great difficulty we have to shield anything from such force. The energy of each individual photon is a crucial component of the momentum necessary to create pressure for gravity to be possible. The shadow of incoming high energy EM wave packets can be pictured as the carriers of the gravitational force, the normal role assigned to the theoretical graviton. Hence, gravitons have been theorised due to the lack of knowledge of radiation pressure and radiation shadowing, and that's why they will never be detected. If photons represent the luminance of electromagnetic radiation, then, gravitons represent the shadowing and can be considered as negative energy waves, lack of photons or photon-holes." 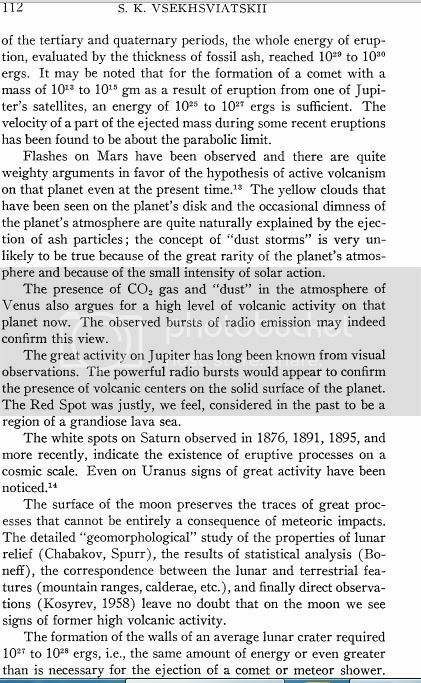 The best scientists of the 19th century believed that there is ANOTHER SATELLITE/PLANET ORBITING THE EARTH, besides the Moon. "We may well doubt whether that body which we call the moon is the only satellite of the earth." "There is at least one non-luminous body of considerable magnitude which is attached as a satellite to this earth." "Invisible moons exist in the firmament." 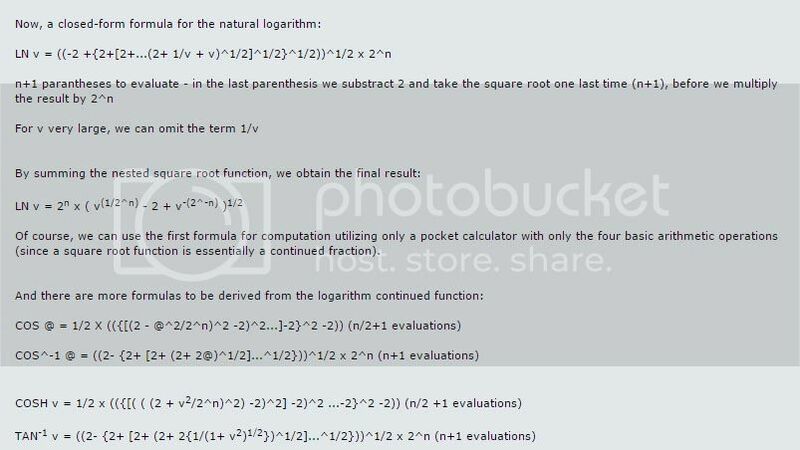 Sir John Lubbock is of the same opinion, and gives rules and formulæ for calculating their distances, periods. Lambert in his cosmological letters admits the existence of "dark cosmical bodies of great size." Do not forget that I can prove to you immediately using the Allais effect, that the Moon does not cause the solar eclipse. From there, it is all over for you. if it can block out the moon, it can block out other stars..
you've never heard of the 'logic effect' have you?